I press on toward the goal to win the prize for which God has called me heavenward in Christ Jesus. All of us who are mature should take such a view of things. And if on some point you think differently, that too God will make clear to you. 4.5 Spiritual maturity and God's Word. It should be obvious by now that whatever your position before the Lord, you fall short of living out his desires of you. Everyone, including very mature believers, continue to sin to varying degrees in spite of their best efforts. After persons receive Christ, they can still sin because, from the spiritual aspect, the spirit which God made to come alive inside of them is like a newborn babe. It has great potential, but it needs to be fed, matured, and exercised. For now the re-born spirit resides in the midst of the old body and has to contend with all its old habits and patterns of thought. Furthermore, the power to overcome sin does not have its basis in believers' efforts, but in God's strength. Therefore, believers' lives need to be spent seeking God's strength and feeding their spirit with his spiritual food. Food for the spiritual nature is God's Word. This is what believers need to be taking in. However, believers cannot expect their new, spiritual nature to take command over their old nature if they keep feeding the old nature with the things it desires; things like selfishness, materialism, pride, and lust. These only serve to strengthen and prolong the old nature, and are the antithesis of the godly attributes which the new nature is warring to reflect. Realize that sin will continue to plague believers because the spiritual and natural desires will be in contention as long as the old body lives. But by continuing to believe in the power of God to change lives, by maturing in the Word, and by confessing and turning from sin as the Lord has commanded, believers will find themselves sinning to a less and less degree. This struggle, no matter how difficult, will prove to be worth our best effort on the day we stand in the unveiled presence of God. Only then will we appreciate that the struggle was worth it because we will see that God is worth it. 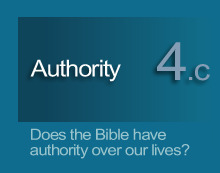 How the authority of Scripture affects us in terms of maturing us.